Firstly, I'm 186cm (6 foot 1 inch or so) and about 83kg. I had read everywhere that it was too small for my build. I did not find this one bit! I fit in it fine! I didnt cinch up the hood on it but I reckon it would cinch up fine. I tried it with an aegismax bag (the lightest one rated at +8° comfort). I went to sleep only in the sleeping bag, without thw bivvy to see how it would go (ill write another review on the bag). Early in the morning the temp got to its lowest - my thermometer said around 9-10deg. I was a tad cool in the bag alone so I slipped on the bivvy. Almost immediately I felt a difference! It made a decent difference to warmth! More testing is needed to say for sure but I would be confident taking the +8° aegismax bag and SOL bivvy down to 0° with a fleece jumper and beanie. I am a relatively warm sleeper though. I didnt notice any condensation - but was only in it for a few hours. At only 250g (or so) this bivvy is great! Waterproof, warm, light! Its great to be used in conjunction with a tarp because it will help keep you dry in really bad weather or if your not using a ground sheet. This is the product I am talking about. 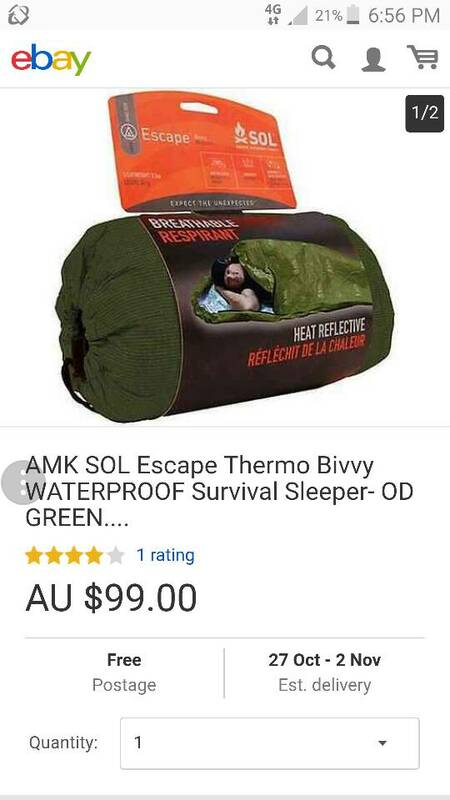 My partner has used this several times now and she says it gives a good warmth boost and it kept her dry under a tarp in a very windy storm. Im definitely going to buy myself one as well. A great piece of gear I reckon.